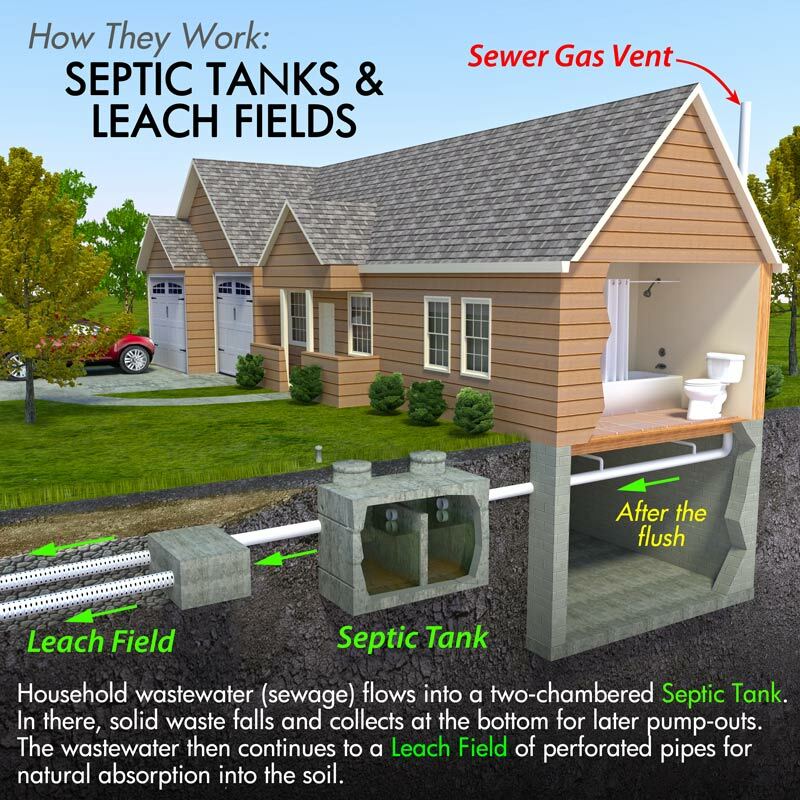 Many homes have a septic system rather than connecting to the city sewer system. If you are one of these many homeowners depending on your system to run properly, it may require a whole lot of care and maintenance and certainly focus on what you actually put down the drains in your home. There are simple tasks that come into play when properly caring for and maintaining your septic system. For starters, this underground septic storage tank that stores solid wastes for an extended period of time can become backed up and the waste escapes into your yard. In order to prevent this from happening, it is important to have a certified professional come in and pump out your septic tank annually, or at least every other year. Next, do not compromise your septic tank’s function by pouring any bacteria killing substances such as bleach down your drains. If you choose to clean with powerful cleaning products simply make certain that you are not flushing them down your toilets or down your drains. Be especially careful with bleach, hydrogen peroxide, chlorine, pesticides and even medications. In addition, it is mandatory that you keep all types of fats, oils and grease out of your drains. These substances can certainly wreak havoc on a typical everyday plumbing system, but the damage it can cause to a septic system are nearly tenfold. Since these substances do not break down, they will, over time, form scum at the top of your tank. When this scum accumulates it will eventually leech out along with all that liquid sewage into your yard and lawn. Further to these concerns, there are a variety of items that should not be disposed of in your garbage disposal or your toilet. There are many products that people tend to believe are ok to flush down their drains. There are even some items on the market that profess to be flushable that should not be flushed down your drains or toilets as well. Some of these problematic items include thick toilet paper, feminine hygiene products, flushable wipes, paper towels, stringy veggies, and flushable cat litter to name a few of the biggest problem items. As is the case with all types of home systems, whether HVAC, plumbing or septic, it is often the things you are not aware of or those things that you do not know that can lead to serious problems. It is highly recommended that in order to detect any problems early on that need repairs rather than letting them go until they turn into costly repairs, having your septic system inspected annually is an absolute must. A septic tank and system requires a great deal of care and maintenance, which is why the professionals here at Steve Mull Plumbing highly recommend annual inspections so as to identify problems early on and provide effective and efficient solutions. And don’t forget that when it comes to top quality plumbing products or services we are the team for you. There is truly no project too big or too small for our friendly, certified plumbers. We take tremendous pride in providing you with all your plumbing needs at prices that are affordable and in timelines that are accommodating to your needs. If you are in need of plumbing repairs or services, then surely you have come to the right place. Take time out to contact our team and schedule your repair or service appointment today. With fall now upon us and the holidays right around the corner, we send along wishes for a safe and happy holiday season ahead from our family to yours!! When is it time to repipe your home?